On 14 November 2016 GlobeCore held a presentation for visitors from Ethiopia. The presentation focused on equipment for purification of mineral oil and servicing of power transformers, along with a demonstration of oil purification equipment at GlobeCore International Training Center. 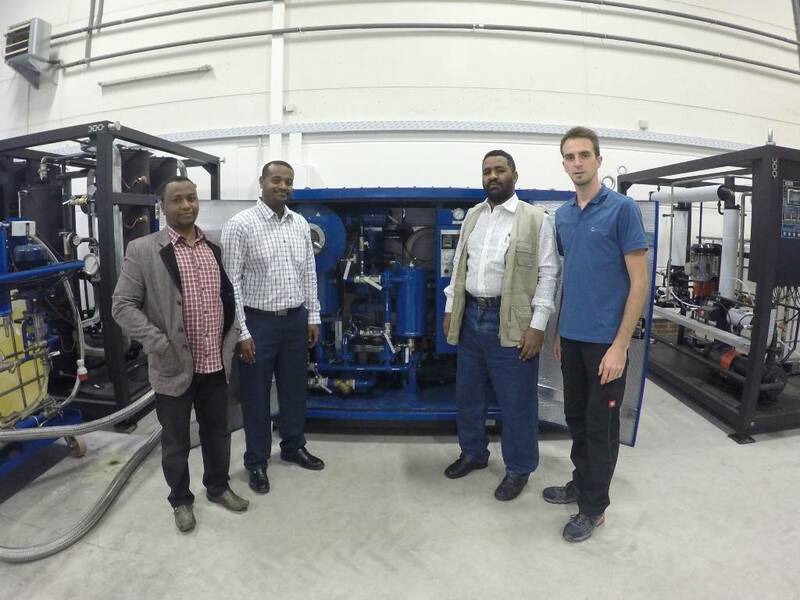 The guests from Ethiopia were most interested by the regeneration technologies implemented in CMM-R and UVR units. The former completely restores electrical insulation oil without the need to drain the oil from the transformer or to take the transformer offline. The latter regenerates transformer, turbine and industrial oil, heavy fuel oil and diesel, pyrolysis liquid and other oil products. The interest was due to the fact that all countries address their environmental issues. Ethiopia is not an exception. GlobeCore thanks our Ethiopian colleagues for their interest in our equipment and the new experience. The doors of the International Training Center are open to all who wish to learn how to use GlobeCore equipment and to those who want to witness its efficiency in person.